BSW (Imperial) - Zinc Plated - Metal Thread Screw Machine are uniformly threaded screws that are designed to be threaded into uniformly threaded nuts or threaded holes in the parts they are intended to fasten. 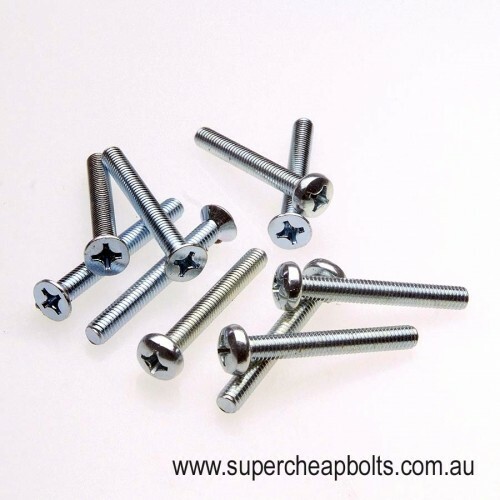 Machine screws are available in a wide array of configurations of head shape (countersunk, pan, cheese), materials, driver head types(phillips, pozi, torx and slot) and sizes. As their name implies, machine screws are used to fasten various components together in machines, tools, appliances, electronic devices and vehicles of every description. Supacheap Bolts currently stock 1/8", 5/32" 3/16", 1/4", 5/16" and 3/8" diameter and up to 3" in length for certain diameters.